Weeds and wild grasses are part of nature and, unfortunately, are an unwelcome guest in many lawns. Herbicides, when used properly, can be an important part of the weed solution. Learning to use herbicides safely is extremely important. It is even more critical for homeowners, since the law does not require it to be learned before spraying pesticides. Therefore, this page will help you. Safe handling of pest control products must always coincide with a knowledge of the dangers they pose. A careless approach will only lead to needless exposure to yourself or others. It can also lead to non-target damage to desirable plants. This section will help you to better understand the basic principles of chemical safety. Click on the link if you would like more information on Effects of Pesticides on the Environment. The term “pesticide” can either be a specific or general term. When used as a general term, it can refer to any pest control product including insecticides, rodentcides, herbicides or fungicides. Always read the herbicide label completely before opening the container. Due to the length of the label, many are folded accordion style and taped closed. To view the entire label, you must peel back the tape first. Be careful peeling the tape, because the label can easily tear. With Murphy’s Law, it will always tear across the most important information. Make sure you have all the proper personal protection equipment (PPE) that is listed on the label before opening the container. Any household items used for herbicide or pesticide use, such as measuring cups, stir sticks, etc. should not be reused in the house. They should be thrown out or used only for pest control use. Some herbicide solutions are concentrated and must be diluted with another liquid (usually water) for use. 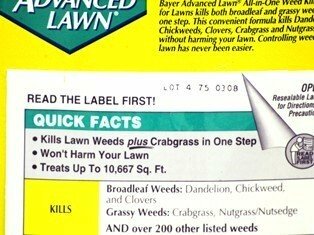 Do not add more herbicide than the maximum rate allowed on the label. Adding more than what is allowed will not give better pest control and, in most cases, it is illegal. Estimate the area to be sprayed and try to mix only the amount you need. Do not dump any excess, but use the spray on the target pests (weeds, grass, etc). If you need to clean the sprayer afterwards, a mixture of ammonia and water will break down most chemical residues left in a sprayer. Never assume a sprayer is perfectly clean. The best shoes to wear when spraying will be made of chemical resistant rubber or plastic materials. Don’t wear tennis shoes or other shoes made from absorbent materials when spraying herbicides. After spraying, remove your shoes before entering the house, so herbicide residue is not tracked inside. Pay close attention to label instructions regarding re-entry times. The use of certain products may require that people or pets stay out of the sprayed area for a specific amount of time. Store all herbicides and pesticides, spraying equipment, and mixing containers away from the reach of children or pets. These chemicals must be kept in the original container with the label intact. Pesticide or herbicide sprayers should not leak. Pump sprayers (especially the cheaper ones) are notorious about leaking around the trigger or squeeze levers. Wear gloves to be safe. Be aware that not all organic herbicides are “safe”. Read labels carefully. If you are unsure, research the product or use a product you are familiar with. No pesticide or herbicide product may be sold in the U.S. until the EPA (Environmental Protection Agency) has approved every aspect of the label. The term “pesticide”, depending on how it is used, can be either a specific or general term. When used as a general term, it can refer to any pest control products including insecticides, rodenticides, herbicides or fungicides. The label is a legal document and contains a lot of information. Any label addendums printed after the label was attached will supersede the label. The addendums will usually be on a specific section of the label. Pesticide and herbicide users are required by law to comply with all the instructions and directions on the label. Your local university extension office can be quite helpful and may be able to clarify anything you don't understand about the product. The Meaning of "Signal Words"
All pesticide products must contain signal words. "Signal Words" are words required by the EPA to warn users about the level of toxicity of the product. The words have specific and legal meanings and the user should take careful notice of them. Note: This is not intended to be legal advice on the current interpretation of label wording. There are four basic signal words indicating four levels of toxicity. Keep in mind that some people may be more sensitive than others to specific chemicals. Caution- This word signals the product is slightly toxic or relatively non-toxic. It has only slight potential to cause acute illness if swallowed, inhaled or exposed to the skin. The skin or eye irritation it would cause would be less than those with other signal words. Warning- This word signals the pesticide or product is moderately likely to cause acute illness if swallowed, inhaled or exposed to the skin. It is also likely to cause moderate eye irritation. Danger- This signal word means the pesticide or product is highly toxic. These products should not be swallowed, inhaled or exposed to skin. It may indicate that it will cause serious eye irritation. 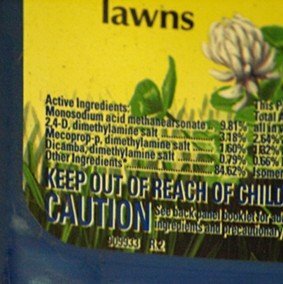 Some pesticides have a time period following an application when children and pets are not allowed on the yard. If allowed onto the yard before the safety period ends and comes in contact with the pesticide, it could result in exposure. Carefully follow safety guidelines. Danger/Skull and Crossbones Symbol/Poison- Indicates that this product is highly toxic and should be handled carefully. It indicates it will cause severe internal damage or death if swallowed, inhaled or absorbed through the skin or eyes. Gasoline, for example, carries this label and is a product we use everyday. Some products may contain more than one word. For example, a chemical may be labeled with a “caution” signal word if it is exposed to the skin, but may carry a “danger” if inhaled or swallowed. Always be safe and take every precaution necessary. These words are not intended to replace common sense. Always exercise caution. Always read the label and if you are ever in doubt, take greater precautions or use a different product. Be aware that “organic” doesn’t always mean “safe”. Some organic products are very hazardous and the appropriate precautions need to be taken. In the pesticide industry, the definition of “exposure” means getting a pesticide or herbicide on the skin or in the body. (2) the toxicity of the chemical. An examination of the Signal Words show that there are various degrees of toxicity. Studies in chemical exposure show that 95% of exposure will be on the skin. Some areas of the body are more absorptive than others. The most absorptive skin on the body is around the genital area. If you have to take a restroom break during spraying or when mixing, be sure to wash your hands thoroughly with soap and water first. Other areas of the body that are highly absorptive is the scalp, forehead and ears. Be aware of any cuts or abrasions on the skin that could come in contact with any chemical. Inhalation exposure is most likely to occur in poorly ventilated areas or from breathing in overspray. If inside, open windows to create air circulation. Do not turn on the central air or fumes could be transported to other rooms. If outside, be aware of wind conditions. The wind can catch the spray and blow it into your face. The eyes will easily absorb certain chemicals and should be protected. Ocular exposure is most likely to occur from a splash during mixing or from spray being blown into the face. Wear goggles or a face shield to prevent this from happening. Oral exposure most often occurs when residue is passed from the hands to food being consumed. It can also occur while taking a smoke break. Be sure to wash your hands with soap and water before handling a cigarette or eating. Spray on calm days to prevent over-spray from blowing into your mouth. All pest control products will contain instructions about personal protective equipment (PPE) to be worn. However, the label will only list the minimal amount of clothing required to keep you safe. You can always wear more protection, but you cannot wear less than what the label prescribes. In fact, it is a legal requirement. The following list contains some common PPE items listed on the label. While some herbicides may only require the first three, other types require more. It is not a bad idea to wear more anyway, so having the all PPE items available is a safe practice. 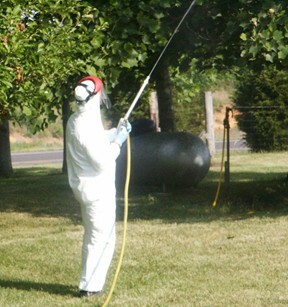 In the photo, the arborist is protecting himself against overspray and pesticide dripping from the leaves. He has on a disposable jumpsuit, nitrile gloves, face mask, and chemical resistant boots. The label, wind conditions and how the products are being used should determine the amount of personal protection worn. Always be safe. The hands are the most commonly contaminated area of the body. The right gloves, therefore, are essential. The ideal glove is one that is non-absorbent and will remain resistant and intact for the length of the spraying operation. Do not use garden gloves made of cotton, leather or other types of absorbent materials. If contaminated, it will hold the chemical on the skin, making the problem worse. Latex gloves are good for some chemicals, but not for others. Signs that latex is breaking down will be a loss of elasticity, becoming soft or spongy, bubbling, swelling, easily tearing or dissolving. Nitrile gloves are a better choice. They are made from a synthetic polymer and have a much greater chemical resistance. Disposable nitrile gloves a very thin with a look and feel of latex. Note: After mixing or spraying, always wash your hands with the gloves on before removing them. This prevents possible contamination to your wrists and hands while removing the gloves. Disposable gloves should only be used once. Non-disposable rubber or PVC gloves should be washed thoroughly before removal and placed in a plastic bag for storage. Do not wear tennis shoes, slippers or similar types of shoes that you would normally wear elsewhere. The chances of getting chemicals on your shoes are very great. Some materials will easily allow chemicals to pass through to your feet. Also, remember that some chemicals “persist” (stay active) for long periods, so you don’t want them on your shoes. Shoes made from rubber, PVC or other resistant materials make good shoes for spraying operations. I purchase mine at Wal-Mart for a fairly low price. Note: Some of these shoes are uncomfortable to wear for any length of time. I always purchase a pair of “cut to fit” liner inserts. It makes a world of difference in how the shoes feel. Remove the shoes before entering the house so no chemical residue is tracked in. If there is any breeze, you will likely have overspray on the legs of your pants. Always remove your pants as soon as you are finished spraying or cleaning equipment. Do not place the pants in the same basket with the other laundry to be washed. Always wash them separately to prevent residue from getting on the other clothes. This is the same for the other clothes you were wearing while spraying. If at some point you spill any chemicals on your pants or shirt, be sure to wash them twice. Then run a wash cycle without any clothes to be sure the washer is clean. The primary purpose of the shirt is to prevent overspray from getting on the arms. Make sure the shirt reaches past the top of the gloves so no skin is exposed. If you splash chemicals onto your shirt or pants when mixing, be sure to change them before spraying. Wash your arms with soap and water before putting on a clean shirt. Clean pair of goggles, or face shield protects the eyes and face from chemical splashes or fine particles from over-spray. After use, put on a fresh pair of gloves and wash the goggles and equipment with soap and water. After they have dried, place them in a plastic bag for storage. The most important thing to remember about PPE clothing, gloves and shoes is this: These protection materials only work if the chemicals remain on the outside of the material. If you allow it to get on the inside due to a spill, splashing or careless work, your protective clothing actually works against you. When this happens, it can hold the chemical against the skin. Change any clothing that is no longer doing what it is intended to do. Always choose the best materials and work carefully. Many weeds are difficult to control. Many chemical herbicides offer a safe and effective solution when used according to the label. Find out how they work and what products are available. Many types of herbicides are available from organic to chemical products. Choosing the right one is important. Click here for information on organic herbicides and how the work. 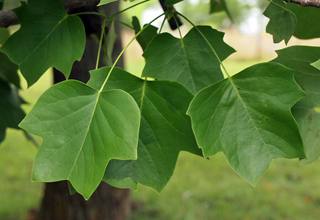 The photo above shows herbicide injury to a tulip poplar tree leaves. A sprayer was dumped near the tree where the roots picked up some of the chemical. Notice the leaves are curling, which is typical of low to moderate damage. 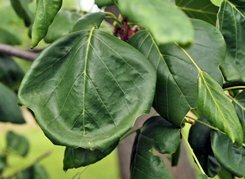 The photo below shows healthy tulip poplar leaves on the tree right next to the damaged one.